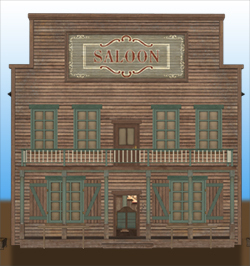 The Three-Pair Tavern is a saloon in Hooter County founded in the mid-1800s as a watering hole for the locals to unwind after a long day working on the land. It was named after the various card games the patrons used to play to pass the time, a name which took on a sightly different and amusing meaning when it was purchased by the West triplets. Despite the changes and passage of time, the tavern is kept as authentic as possible to its original roots, making it a popular venue for Hooter County residents.